A weed is a plant that interferes with human activities, including forage production. Weeds interfere with forage production in a number of ways: they reduce yield, they lower quality, and some are poisonous to livestock. There are five general categories of weed control methods: preventative, mechanical, chemical, biological, and cultural weed control. Integrated Pest Management is an approach to weed control that utilizes various combinations of the five weed control methods to reduce weed levels to an acceptable level. For intelligent and efficient weed control, to have some knowledge of weed life cycles is useful. For example, annual weeds in an annual crop may be best controlled by tillage, whereas controlling perennial weeds in a perennial forage crop may require the use of selective herbicides. In making the decision of which weed control methods to employ, the forage producer must balance the cost of treatment with the expected increase in profit. Despite careful measures to avoid weed invasion, weeds will still find their way into pastures, crop fields, and rangeland. Any type of serious soil disturbance will often provide an opportunity for weed invasion. This typically includes recently plowed fields, watering areas in pastures, livestock trails, or overgrazed areas. Treatment for weed problems may involve the use of preplant herbicides, periodic cultivation, selective postemergence herbicides, crop rotation, or pasture renovation. There are numerous sources of information on weed control available in printed and electronic form. 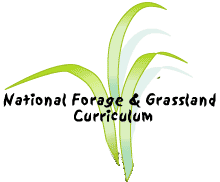 For information specific to a given locality, the county extension agent and state agricultural college (land grant college) can provide extension bulletins specific to various forage crops, pasture, and rangeland.